Many of the small business owners and managers I speak with are frustrated with social media. The majority have put a lot of time and effort into social media sites like Facebook, Twitter, Google+, and now Pinterest – with little if anything to show for it. So today I thought I’d share an almost “real-time” example of WHY you want to use Facebook. It clearly shows how to use the power of social media to your advantage and how it will help you promote and grow your business effectively with Internet marketing. 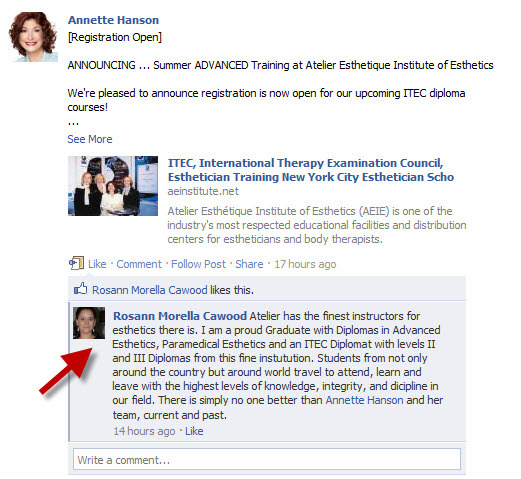 Yesterday, my client who is one of the most well recognized training schools for estheticians in the United States, asked me to post information about an upcoming class. I didn’t just THROW up some words and sentences, that’s what most do and it rarely works. The result of this effort: an unsolicited, “grand slam” testimonial. You almost couldn’t pay for this! Next step: Using this and others, we’ll now leverage this content and use it across all of our online assets including our e-newsletters, at the blog, and at the website.